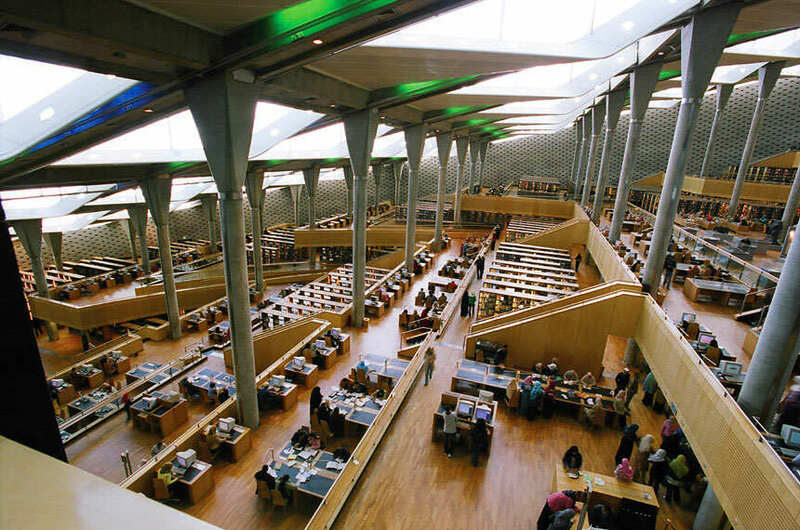 My hand trembled with anticipation as I opened the doors and stepped onto the interior observation platform of the new Library of Alexandria. The view hammered the breath from my lungs like a blowand sent a wave of gooseflesh rippling up my arms. Tier upon tier of layered floors spread out below me, sliced on an angle to a depth of 11 storeys. Slender columns reached up to grasp the slanted roof, and skylights pierced the space between, casting magnificent shafts of natural light onto modern wood. From the floor far below came the rustle of paper; a dull murmur of voices; the squeak of a chair; and the scarlet flash of a head scarf. As my nose filled with the scent of books—a scholar’s incense—I realized the vast hall felt more like a cathedral than an institution. It was a fitting image, because that’s exactly how I saw it. To me, a library has always been a sacred place. Libraries are the accumulated storehouse of our collective memory. They contain our consciousness; our deeds, hopes and dreams, and all that we have ever done or thought both good and bad: nothing less than the thread of our collective growth as a species. It is in libraries that the incredible miracle of the human race is contained and so to visit the modern reincarnation of the Ancient Library of Alexandria, once the font and seat of all Western knowledge, was a form of Hajj, a religious duty. The sole surviving manuscripts of most of the Greek literature and philosophy handed down to us were based on copies from the ancient Library of Alexandria that made their way into Europe during the cultural emptiness of the Dark Ages. The library—perhaps the greatest the world has ever seen—rose to prominence under the Greek Ptolemaic Dynasty (305 to 30 BC) and flourished during the colonial rule of Rome (30 BC to AD 641). The exact date of the library’s final decline remains unknown, but it doesn’t seem to have been in existence at the time of the Arab conquests of Egypt in AD 642, long before those same Dark Ages swept Europe. It’s difficult to imagine just how close we came to losing our collective past. Without our memories, who are we and what do we have? At first, the conquering Arabs made some effort to adapt Alexandria to their needs, but they were out of touch with the Mediterranean civilization—seemingly so idolatrous and so foolish—which had a strange preoccupation with all things intellectual. To the Greeks, intellectual curiosity was the highest ideal. To the incoming Arabs, the calm of the soul was life’s purpose, and an obsession with theorizing was distracting and possibly even heretical. These two world views could not be reconciled, and, in the end, the general Amr and his conquerors edged away to start a new Egypt of their own near Cairo. Alexandria fell into decay. What is the traveller to 21st-century Egypt to make of all this? The faded remnants of Alexandria represent nothing less than a Greece that sought to discover truth and create beauty. It was a thoroughly Hellenistic city with an outlook and a culture alien to the native Egyptian traditions that surrounded it, and which it ruled over. These two peoples lived the same lives and ate the same food, but their world of thought was attached to completely different cultural systems. That influence continues today. Alexandria and its surrounding coast have always looked toward the Mediterranean, while the rest of Egypt looked toward the Nile. I sensed that this dichotomy held a fascinating clue to the modern character of this complex country. To come to grips with it I had to travel backwards through time. In Egypt, that is simply a matter of travelling up the Nile. Cairo is by far the largest city in Africa, a vast honking cacophony of battered wrecks, rattling engines and shouting people all trying to get across town at the same time and, seemingly, to the same places. Within 10 minutes of arrival, the exhaustion and throbbing head of an overnight flight are compounded by this traffic and by the city’s distinctively foul-smelling air, so heavy with pollution it has turned the walls of the endless concrete apartment blocks a yellowish gray.By contrast, my room at the Conrad was a world away fromthe chaos of the streets, a cool, sheltered 18th-century oasis of calm, hospitality and sensory relief. But I had only to slide open the clean glass of the door to admit the sounds of distant honking and that distinctive Cairo smell. In Egypt all such barriers are a temporary illusion at best. The next morning we crossed the Nile to Giza early, before the heat of the day pounded the desert floor like an anvil, draining the life from anything that dared to step clear of the shade. To understand the past of Egypt, I would have to understand its chief obsession. I had to cross from the world of the living to that of the dead. In ancient times, the east and west banks of the Nile were separate spheres: in the east were the dwellings, blessed with life from the rising sun, while the west bank was equated with the setting sun, the land of death, where silent tombs were slowly choked by the relentless blowing sand. But today that division no longer holds and Giza (on the west bank) is just another busy suburb of the capital, swarming with traffic and resounding with head-splitting noise. The Cairo of the present, has nearly surrounded the colossal tombs that most foreigners associate with the country. I’d always imagined the pyramids as being slightly vulgar, absent of beauty, with nothing to recommend them except sheer astonishment at their size. They are, after all, the burial places of a family of kings and their courtiers, allegedly constructed on the suffering backs of their starving people so the rulers might dominate the afterlife just as they’d ridden roughshod over this one. Those impressions were unfounded. Up close, the pyramids lose any sense of vulgarity, simply because they melt away into the vast, flat landscape of the desert behind them. The emptiness of the land and the emptiness of the sky dwarf the structures so completely that I never realized just how massive each stone was until I stood next to it myself and discovered that a single block came up to my shoulder. I got my second surprise of the day when we went inside. 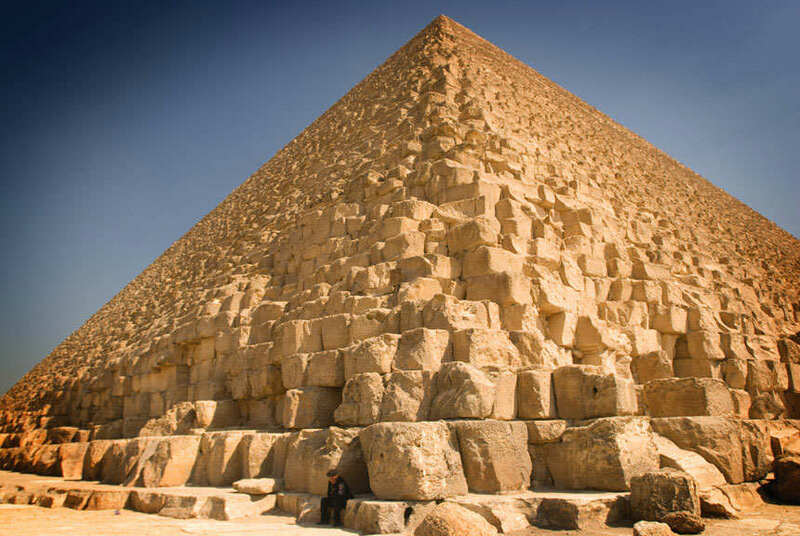 I expected the Great Pyramid to be another sterile tourist site, made safe to protect bumbling foreigners from themselves. I never expected it to be an adventure. Beyond the short entrance corridor, chopped into the pyramid’s side by treasure seekers around AD 820, a tunnel of slick rock climbed away from me at a mathematical 45 degrees and vanished into the gloom. I pulled myself up it, bent double, with my back scraping the ceiling, gripping wooden slats that had been hammered into the floor to prevent a tourist landslide. Beads of sweat dripped from the end of my nose, and I watched them spot the stones between my hands. I struggled for air. I don’t know if it was the weight of all those stones pressing down or simply the weight of time, but it felt as though the pyramid was slowly crushing my lungs. Up ahead, a man panicked and had to turn back. I pressed myself against the wall to let him pass. I could barely see his wildly rolling eyes—then continued on as his hyperventilating panting faded into the distance. I felt a little like a tomb raider, invading someplace sacred, a place I didn’t belong. The tunnel eventually ended at the King’s Chamber, the largest room in the structure. It could apparently hold a doubledecker bus, but it felt much smaller, in the same way that the surrounding desert dwarfed the structure from without. Though the Great Pyramid had apparently been built to house the mummified remains of the pharaoh Khufu, no one had ever been buried there, and only one confirmed inscription of his name was found inside the entire barren structure. The room contained an empty sarcophagus of Aswan granite; nothing more. In a way, its forlorn emptiness was appropriate. The pyramids had been built at such great cost—of monetary wealth and human suffering. But there was nothing to show for it. It had all been such a futile attempt to outlive time. Later that day, back in metropolis, past and present coalesced at the Cairo bazaar. Deep within the gloomy recesses of its covered maze, traditional goldsmith shops and date vendors were hemmed in by stalls offering a laundry list of tourist kitsch: glow-in-the-dark plastic figurines of the god Anubis, a bottle opener in the shape of Tutankhamen’s mask, Jimi Hendrix immortalized on a papyrus scroll. Around the edges, oblivious to it all, old men chewed the stems of bubble pipes and sipped small glasses of mint tea, time-shifting behind glassy eyes through entire worlds of memory. They could have been sitting there for centuries. Every layer of the past seemed to coexist in Cairo. Only the present felt impermanent—it occupied the hazy edges, like fog, when I took a step toward it, it seemed to pull away. I’d come into contact with ancient Egypt’s strange cult of death at the Giza pyramids, but what of its life? 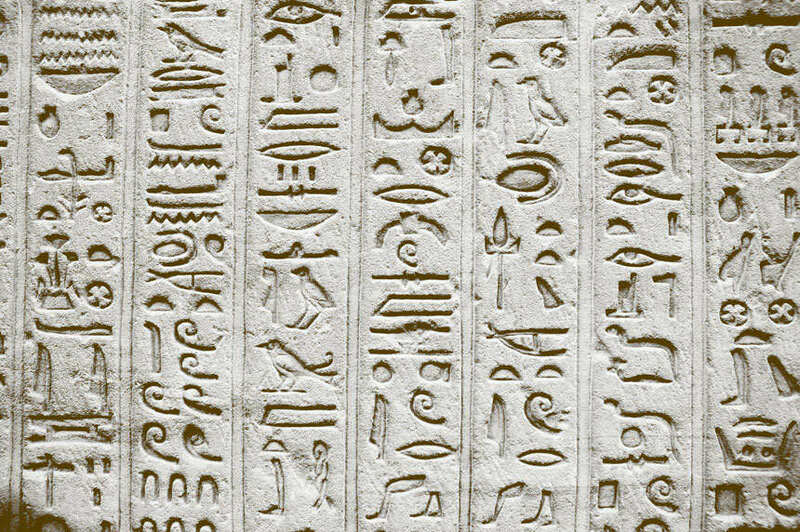 To understand that, one had to understand the river Nile. To the east and west of the Nile valley lay inhospitable and sometimes mountainous desert wastes, sparsely populated in ancient times by a few raiding nomadic tribes. The entire civilization of the country, once so mighty and awe-inspiring, actually existed upon a strip of land of between 10 and 20 kilometres wide alongside the great river—because that slender thread was all they had.The river’s annual flooding, described as far back as 440 BC in Herodotus’s Histories, entirely dominated the history, character and development of Egypt. The people’s survival depended upon the rich layer of silt deposited each season along the flood plain and in the Nile delta, and that ebb and flood dictated the rhythm of life in all its aspects. 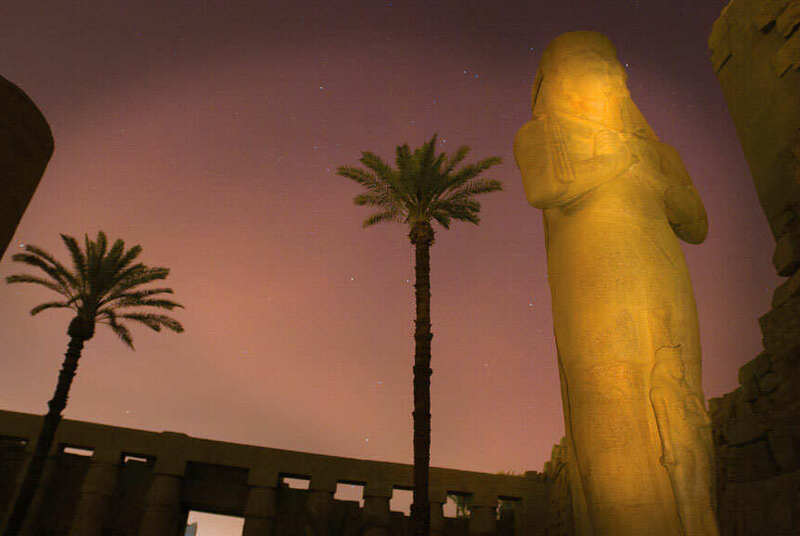 In order to gain some understanding of all of this, I travelled upriver to the ancient centre of Luxor—between 2025 to 1700 BC, Egypt’s New Kingdom capital of Thebes. In Luxor it’s easy to get a sense of the depth of Egypt’s history, and just how many layers overlap there. At the centre of town, up the bank from the Nile, sits Luxor temple, built during a period when New Kingdom art had reached its peak (circa 1417 BC). At its most formal level, Egyptian religious institutions were dominated by the great temples of the traditional gods. The temple of Luxor was established to worship the Theban Triad of Amun-Min, Mut, and Khonsu, their images graven into the walls and pillars in elaborate hieroglyphs in which every gesture represented a symbolic world. Luxor is unique in the deep cultural palimpsest that is preserved there. Its darkest corners shelter swaths of the original paints that breathed vibrancy into these images at a time when the gods still lived. Other corners are overlaid with paintings from Roman times, entire walls hijacked by Christian meaning. In a final coup de grâce, when the ruins had been buried beneath choking sands, locals had built a mosque atop the protruding stones, completely oblivious to what lay beneath (both physically and metaphysically). Time is thick in a place like Luxor. Its ripples are entirely palpable. Such ruins should be seen in solitude, by night. Looking up at the stars from between the massive columns that line the processional way, I felt as though I was at the bottom of a narrow gorge or a deep well of time, embodying the will of the statues and gazing out calmly at eternity. My hotel in Luxor was located on the west bank of the Nile, beneath the Theban Hills, and it, too, seemed to be of another time—in this case, the heyday of the Ottoman Empire in Egypt (1517-1798). In truth, the Al-Moudira was less a hotel than a sprawling palace. Winding stone paths linked separate buildings of four suites, each grouped around their own peaceful garden courtyard. The domes of the ceiling were inlaid with cut glass, through which the sun cast gentle blue-green rays onto the crisp Egyptian linen of my canopy bed. The walls held cracked photos of life in Egypt during the French and British expeditions up the Nile, and I quickly became lost in their sepia tones. When I tired of imagining that pith-helmeted past, I swung open the latticed windows onto my garden courtyard, where begonias, daturas, oleanders and cacti sheltered the birds whose song summoned my mornings and blessed the evening’s cool. Not far from where I sat nursing a cool gin and tonic, the Valley of the Kings slept in sepulchral silence, inhabiting yet another layer: the bridge between the pharaohs of old and the imagination of the present. More than anyplace else, this forlorn valley with its dust-choked tombs has come to symbolize everything we now associate with Egypt. It was here that the explorer Howard Carter stumbled upon the intact burial place of a minor king. The riches contained in this crypt ignited the imagination of the world, and forever defined the country in concrete terms: mummies, gods with the bodies of men but animal heads, elaborate funeral rites, the Book of the Dead, and gold delicately worked into the most ethereal forms. Thanks to Tutankhamen, most people’s perception of Egypt is locked several millennia in the past. But what of the modern nation? How could one take its pulse amidst so many layers of history? Where does the present fit into our scheme? For that I would have to travel further up the Nile, to Aswan. In Aswan, the desert closes in on the river. Sparkling blue waters are interrupted by the rugged extrusions of granite, which once formed the dreaded First Cataract that impeded upriver navigation and created the historical southernmost boundary of Upper Egypt. Patches of water hyacinth float in the shallows where palms and tropical shrubs cast shadows and sway in the gentle river breeze. Out in the current, the lateen-rigged sails of felucca glide past with effortless grace. That rejuvenating setting has lured tourists and colonials to Aswan for years. Agatha Christie wrote portions of Death on the Nile in its famous Cataract Hotel, and Winston Churchill stayed there, as did King Farouk and Princess Diana. It is also at Aswan where modernity and the Nile come head to head, and so far modernity is winning. Thanks to the massive damming projects of the 20th century, the Nile no longer floods according to its ancient rhythms. That function is now carried out by the Aswan High Dam, built by President Nasser between 1960 and ’70. This massive engineering project brought large areas of new ground under cultivation, boosted agricultural productivity, and provided hydroelectricity for a large part of the population. It protects the people from drought in times of shortage, and it holds back disastrous floods in times of plenty. But the High Dam has also brought unexpected consequences: a population boom that now threatens to outstrip those new resources, and a reliance on chemical fertilizers to provide the nutrients that were once washed down naturally in the form of silt. But the most visible consequence of the dam is the formation of Lake Nasser, the world’s largest reservoir, which backs up for over 500 kilometres and is more than 180 metres deep. This man-made flood inundated the homeland of the Nubian peoples and submerged many ancient monuments, only a few of which were relocated to higher ground. The face of the land was altered forever, and the effects of the changes are still being felt today. 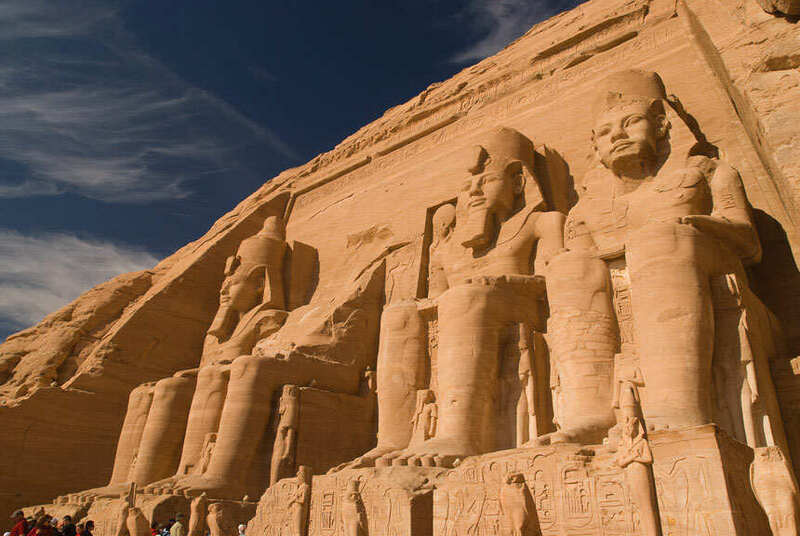 figures was so precisely aligned that the rays of the sun illuminate the inner sanctum deep inside the mountain on the pharaoh’s birthday, and on the anniversary of his coronation. It is this most ancient Egypt with which we are obsessed, an Egypt that symbolizes the romance and the idealization of a lost past, a time when we were capable of forgotten feats of engineering and thaumaturgy, of monumental works with simple tools. Our idealization springs in part from a dissatisfaction with the pedestrianism of our civic present. Ruins and the dreams that populate them tell us more about ourselves than they do about the ancients. As travellers we don’t want the Egypt of today—we seek the Egypt of that idealized past. But where does that leave Alexandria, remnant of Hellenistic Egypt, the starting point of our quest? My Alexandria had always been a city of the imagination: the Alexandria of the novelist Lawrence Durrell and his famous fictional quartet, and the nostalgic poems of Constantine Cavafy. including the Greek—but an echo of it remains. I wasn’t the only one who felt it. “Alexandria calls to me,” said an ex-pat friend who lived in Cairo. “Locals say the city is woven from many cities, that it is one of the true monuments to the architecture of the imagination. For me, Alexandria compares in manifold coherence to the Paris of Proust and the Dublin of Joyce.” The city has many faces, and it seems large enough for us each to shelter our own Alexandria of the mind. In the palimpsest that is modern Egypt, that short burst of Hellenistic civilization on the coast represented rational thought, inquiry, civic values and an obsession with the present, but also literature and poetry and the study of ourselves. Its ancient library sat at the centre of a great cultural blossoming. For six and a half centuries (from the 3rd century BC to the middle of the 4th century AD), the city of Alexandria didn’t just rule Egypt, it dominated the eastern Mediterranean politically, economically and culturally, and it rivalled the new eastern capital of the Byzantine Empire, Constantinople, for another three centuries, until the Arab conquest of 641. During that time, there was virtually no area of intellectual activity to which Alexandria was not a major contributor. Any discussion of the history of literature, ideas, scholarship and science would have to take it into account. Some of the achievements associated with it included: Gnosticism, the university, pastoral poetry, monasticism, the romance, grammar, lexicography, city planning, theology, canon law, scholasticism, Neoplatonism, and literary criticism. The Arab conquest ended Hellenistic influence on the coast, and modern Egypt became an Islamic civilization tinted with the ghosts of its Pharaonic past. But Alexandria’s influence did not end with the city’s decline. It spread north to Western Europe and the isles of the United Kingdom, and eventually to North America, and it grew into the intellectual tradition that underpins what we refer to as our Western civilization. Today, with the reconstruction of its ancient library, the city of Alexandria represents the firmly planted roots of what we—the West—have become. Its history has come full circle once more. Those are the forces that built the High Dam at Aswan, and those are the forces that are now struggling to take over modern Egypt even as its consciousness clings so deeply to the mysteries of its past. The outcome of that struggle is yet to be decided.